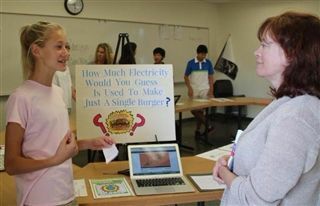 This Spring, 7th-grade students and faculty embarked on a multi- disciplinary project focused on the causes and impacts of climate change. Students created wind turbines in Life Science, read essays on global water issues in English, participated in a climate change Model U.N. conference simulation in Social and Community Studies, and more. Students were then asked to reflect on all they had learned, and develop an awareness campaign around an aspect of climate change they felt strongly about. On April 13th, students shared these VOICE project campaigns with parents, faculty, and friends during a community showcase and celebration. The students used research, compelling case studies, and concrete calls-to-action to educate attendees on everything from reducing plastic bag use to helping reduce greenhouse gas emissions by adopting a vegetarian diet.